I always start these notes off the same way. I need a new introduction. Good evening, I will start with that tonight! I hope you are all anticipating your kids going back to school, here, school starts tomorrow. School shopping done? Get those supply lists and get to shopping! I miss those days, although I always do a little shopping for Maddie my oldest grand little and send it to her. We get to shop together this year since she is here, but, sadly will be leaving in about 10 days to go home to NJ. WHY did I even bring that up? I am going to be sad beyond sad to say goodbye to her but I know she is happy, healthy, and full of joy and what more can you ask for them? Anyway we will do some shopping soon and send her off with it all! I have had this breakfast casserole running through my brain for a good 2 months now. I tried to make it really difficult and different, and the reality is, none of that made it better. I stuck to some old standbys that everyone usually has on hand and it turned out perfectly. I mean, like REALLY freakishly delicious and I would never argue with freakishly delicious! Serve this with little toasts, OR.......add some salsa to the cream cheese mixture and serve with tortillas! Umm-hmmm.... GENIUS, my sentiments exactly. I will make it for my darling Geo that way next time. He will think he is in heaven. As if being married to me isn't heaven in and of itself. Pfftt. 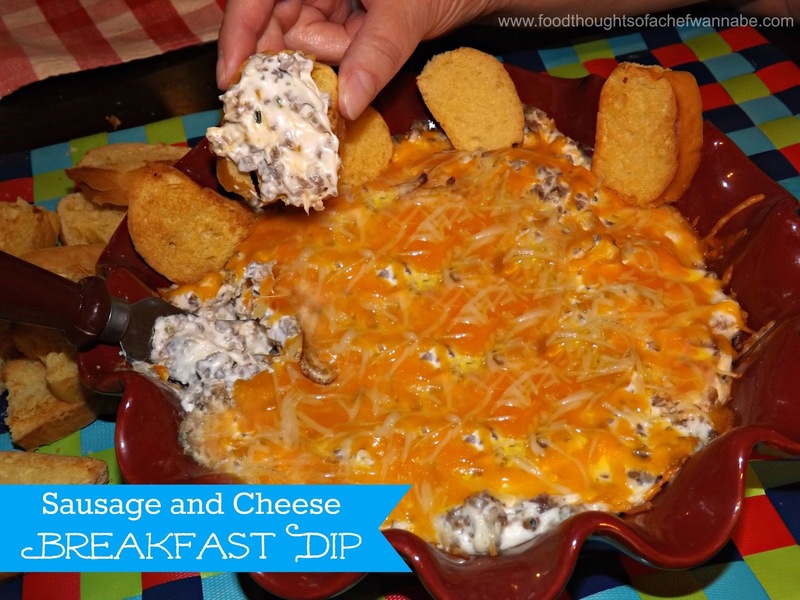 Enjoy this easy, quick make ahead dip, that you can serve for any breakfast or brunch. I don't know anyone who wouldn't love "chips" and dip for breakfast! Preheat your oven to 375 degrees F. In a bow combine, browned ground sausage, cream cheese, chives, and 1/2 cup grated cheddar cheese. Mix until completely combined. Pour into a small casserole dish, I used about a 9 inch one and it was perfect. Sprinkle the rest of the grated cheddar and Parmesan cheese on top. After you have sliced your bread or gotten your cocktail loaf out, just place it on a baking sheet in a single layer and put under your broiler for a minute or 2, flip and do the same. Just get it golden and crispy. You can certainly just use plain toast cut into triangles. This can EASILY be made the night before and popped in the oven in the morning. Breakfast dip.....does it get better?! Yum, Chris! Can't wait to make this. It's low carb so I'm guessing I might make a lettuce wrap or pork rinds to dip! MMMMmm... Thanks, hunny! You are very welcome Lin! I hope you enjoy it and as always, thanks for stopping by! This sounds wonderful! Did you ever try it with salsa? I'm thinking I'll make this for a quick dinner before we take the kids out on Halloween. That looks divine!!! I'm going to have to try it sometime!!!! It IS divine!!! Thanks for stopping by!! !